Mr. Baker holds the rank of 7th degree Black Belt in Goju Ryu Karate-do, 6th degree Black Belt in Shorin Ryu Karate-do, and 1st degree Black Belts in Okinawan Kobudo and Zenkoku Ryukyu Kobujutsu (traditional Okinawan weaponry). 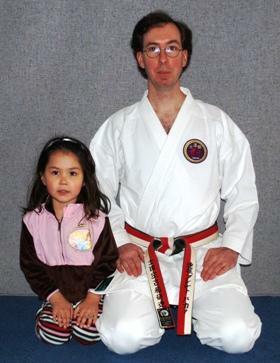 He holds certification as a Kyoshi (grand master instructor) and has been training since 1984 and teaching since 1989. He has been inducted into both the USA Martial Arts Hall of Fame (as “Shorin Ryu Master of the Year” on April 24, 2004) and the World Martial Arts Hall of Fame (as “Goju Ryu Master Instructor of the Year” on June 16, 2007). He currently serves as a member of the Advisory Board for the Shidokan International Karate-do/Kobu-do Training and Research Federation and is the NH State Representative for the International Karate Kobudo Federation. Mr. Baker received his Bachelor’s of Science from St. Lawrence University in 1996. His major focus of study was the field of Biology, with a minor in Education. At the time of his graduation, Mr. Baker also received his New York state teaching certification. Upon moving back home to New Hampshire, Mr. Baker received his NH teaching certification and began a career in public education. He currently teaches science in Sunapee, NH, in addition to his role as director of Rising Sun Martial Arts. (His school web page can be found here.) He also spent several years working as a teaching assistant in the American Museum of Natural History’s online graduate program, the Seminars on Science.